I own this just for the cover, pretty cool how Kitty Pryde made it but Byrne wouldn’t leave his greatest co-creation absent such an historic event! 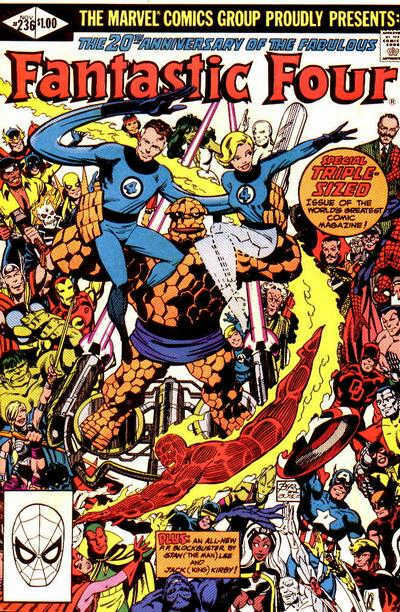 Typing about historic, this is the extremely famous, Fantastic Four “Terror in a Tiny Town” story which is just awesome! Doom has shrunk the FF and they figure it out but the way they do and the way they escape is such classic! No wonder it has been reprinted as often as it has! This is one of those comics that I can’t believe I own. This would make a good plot to a FF movie. Couldn’t be the first one but it could work as a third. Issue opens with a flashback / dream sequence of the Fantastic Four’s fateful original space trip. Johnny wakes up from a recurring dream. The Fantastic Four are just regular folks in a small town. Ben isn’t the thing, he is married to Alicia and Puppet Master is happy for his daughter and son-in-law. The entire team is having these dreams. I like the idea, without their powers, that Reed and Sue are in the throes of an awesome marriage. Franklin is their son in this land. Reed isn’t very good at his job as a researcher / professor. Professor Vaughn is constantly on his case and undermining him. Reed suspects the dreams mean something, so he cuts himself pretty deeply. He gathers his family together and tells them that they are living fake lives. They confront Puppet Master, he reveals that there is a ruse but it is worst than they know. Just then, a voice bellows from above. A giant Doctor Doom is watching over them. Doom has the team, plus Alicia and Franklin hooked up to machines that surround Liddleville (get it?). Doom’s main plan is to just let the team live the rest of their days in miniature bodies. Reed is creating a plan of action. Poor Ben, he has everything he ever will want right here. Reed created a machine that will zap them with cosmic rays. Ben volunteers to go first. It works and now he is a little Thing. They all get their powers back and start fighting little Doombots. Once they are free of Liddleville, they try to break the machine. Sue saucers off to find Doom, who is playing the piano like a pimp. Sue sees Doom’s unmasked face. Doom heads over to Liddleville and tries to blast the Fantastic Four, he overloads the machine and the heroes are free and back in their bodies. When Doom zapped Liddleville, he created a loop and is now stuck in the puppet Vaughn body, that he was using to mess with Reed. There is a Stan Lee and Jack Kirby back-up story. There is a Hostess Fruit Pie ad with the Hulk vs Phoomie Goonies. If you ever wonder, What If Ben stayed in Liddleville, What If? 109 is the issue for you.